Friday I got to leave work a bit early which was nice. The office was really dead, because most of our costumers weren't even at work themselves, so I think that resulted in less to do for everyone. After I returned home and got in some warm up on my shiny new Atari with a friend, I went out to eat at Friday's with a group of people that I went to high-school with. It was nice, as I don't really get to see them much these days. One of the girls is in the Navy now, so she's been bouncing all over the globe for the last few years. I guess shes in DC now, but who knows how long that will last. We went bowling and then to a few bars in downtown Springfield. It was a nice eventful evening. Saturday I got a package postmarked from Japan. I didn't have any idea who it was from, as I know several people in Japan, but none of them have developed a habit of shipping me gifts(unfortunately). This particular package was from Hitomi Tanaka, a high-school aged girl that we hosted at our house November 16-21. She was part of a student delegation from Ashikaga(Springfield's Sister City) that won a Gettysburg Address speech contest, so they got a free trip to Abraham Lincoln's favorite place ever, Springfield. It was a great experience, and I think that my parents enjoyed it very much. They were visibly sad when it was time for her to go home. So she sent us a box of gifts to say thank-you. Lots of classic Japanese presents, all wrapped Japanese style. The Japanese feel the need to put much more effort into the packaging of the present than we do, so much so that it sometimes seems like the presentation is more important than the gift itself. 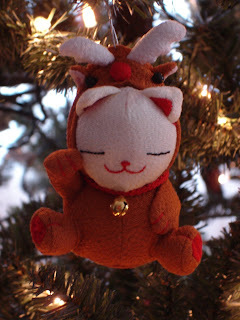 My favorite thing in the box were some little cat Christmas ornaments, which we promptly added to our tree. My friends just happened to have a spare ticket for the Chicago Bulls game Saturday night against the Charlotte Bobcats. So off to Chicago I went. Apparen tly the Hornets moved to New Orleans, and the Bobcats were created to replace them in Charlotte. That was news to me. The fact that before today I had never even heard of this team should probably give you a good indication of how much I know about the NBA these days. But, that's ok, because I enjoy watching the games all the same. It was pretty good times, and the Bulls ended up winning 115-76. 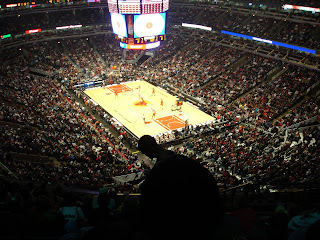 The high point of the game was when everyone in the stadium won Big Macs because the Bulls broke 100 points and won. We ate them the next day. Good times. 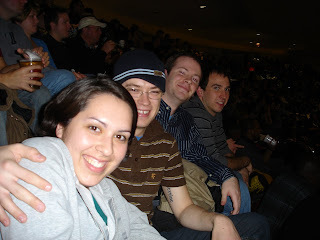 I've only been to one other NBA game before, and it was a year or two ago. I had forgotten how nice basketball games are. Its indoors, for starters. And since the United Center is so much smaller than say, Busch Stadium, even the pretty bad seats that we ended up having are still close enough to the players to be enjoyable. After the game, I had been planning to hit the bars in Chicago, but I was so tired that I went to bed early. No heart at all. Well, I better get to bed so that Santa will come. Have a Merry Christmas. This is the famous lazer show opening at the Bulls game. I apologize for the blurriness in this video, I'm not quite sure what the deal with this one. You get the main idea anyway.